As the world of play for children continues to be infused with technology-driven stimuli, it has become imperative to introduce them to other unique and engaging forms of play and storytelling. With the repertoire of wonderful traditional and folk art forms of their country at our disposal, there is a wide array of mediums to sensitize children to the region’s vast art and cultural heritage. It has to begin with making art and crafts relevant to the current context, to extract it from the annals of history and build an understanding of them as a means of communication and expression, so it can continue through and beyond the digital age. 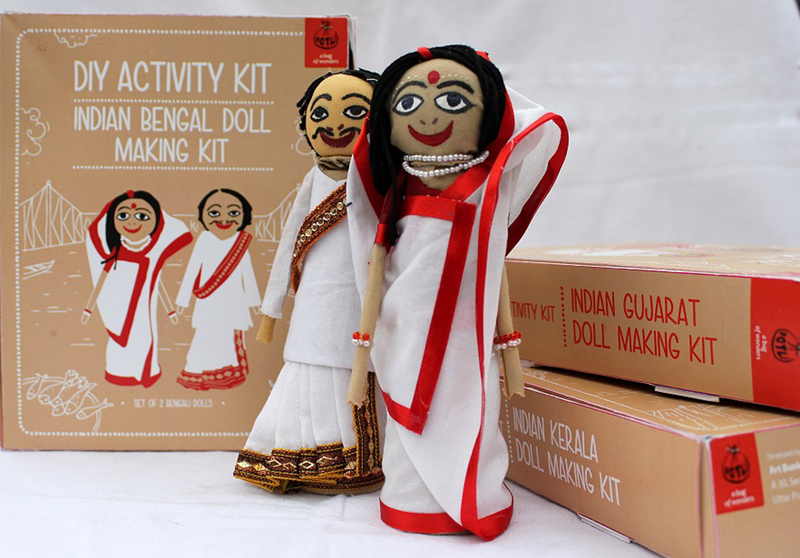 The traditional craft of doll-making, locally called ‘gudiya hastashilpa‘, is still practiced in villages of Rajasthan, Gujarat, Madhya Pradesh etc., in India. It serves not just as a form of art but also as a means of earning a livelihood. Today, these dolls are seen as cultural carriers and storytellers of age old artistic traditions, dressing styles and occupational practices of various regions. Using this as a theme, Potli, run by Pooja Ratnakar, has been engaged in creating such beautifully illustrated games and DIY (Do-it-Yourself) kits for children. A graduate of NIFT (National Institute of Fashion Technology), India, Pooja travels extensively across the country’s craft communities and is focused on reconnecting children with Indian traditional art and craft through simple and fun approaches and at the same time, sustaining these old art forms. Her range of games and kits helps in introducing not just traditional and folk art to the young generation, but also bring up some very interesting but forgotten tales from mythology. Inspired by folk-art such as Bihar’s Madhubani , Kerala’s traditional Mural art, Patua paintings and more, these are a medium created with the hope that “children are exposed to the age-old crafts and it seeps into their daily lives and becomes meaningful”, says Pooja. 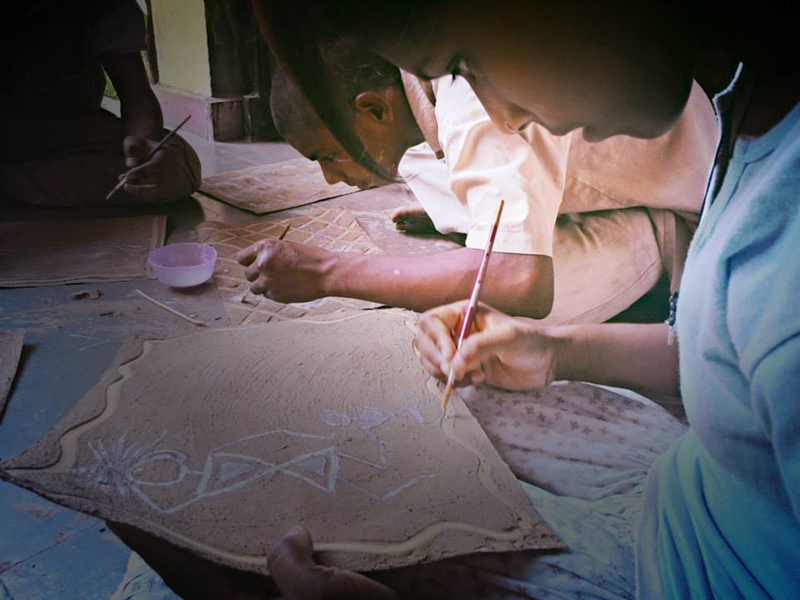 “The idea is to create imprints in their mind using these crafts. Recollections of this exposure may then spring up at any time in their lives in future,” she adds. Another organization involved in making culturally-relevant play kits for children is Avani, based in the Kumaon region of Himalayas. They initiated work on developing and disseminating appropriate technologies for meeting the energy and water requirements of the local villages, promoting craft-based (development of handmade naturally dyed textiles) and farm based livelihood opportunities. Their tie & dye with natural dyes kits, naturally crafted crayons, water colors etc., are inspired by Goraiya, a small joyful bird commonly found in the Kumaon region of the Himalayas in Uttarakhand, India. The crayons are handmade from local materials, using pure beeswax and natural pigments such as Eupatorium, Walnuts and Madder, while the watercolors use various natural ingredients such as Pomegranate, Indigo and Eupatorium. Active Hands by Vineeta Nahar has also created weaving, tie-dye, hand quilling kits Do-it-Yourself (DIY) kits that are based on traditional crafts with a contemporary touch. It aims to give children and even adults an opportunity to explore and express their hidden creative talent. Each craft kit has been designed to develop and enhance hand skills, design aesthetics, technical ability and craft appreciation. While crafting, children will experience a sense of achievement, as they see a creative, functional and utility product emerge from their efforts. Through these play kits and games, children are exposed to natural and handmade crafts and culturally rich heritage art, thus paving the way for these age-old techniques to remain relevant in today’s otherwise digitally focused context. These craft kits and products are available on http://www.jaypore.com. The story was first published in HAND/EYE Magazine. Posted in Art, Crafts and tagged activity kits, art, children, Craft, digital age, DIY kits, games, learning. Bookmark the permalink.